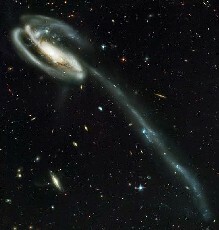 The Tadpole Galaxy (UGC 10214) is a spiral galaxy that has been grossly distorted by a small interloper – a nearby, blue compact galaxy visible. The Tadpole lies about 420 million light-years away in the constellation Draco. Strong gravitational forces from the interaction have created an incredibly long tail of stars and gas stretching out more than 280,000 light-years. Numerous young blue stars and star clusters, spawned by the galaxy collision, are seen in the spiral arms, as well as in the long tidal tail of stars. Each of these clusters contains up to a million stars and will redden with age to become in time globular clusters similar to those found in essentially all halos of large galaxies, including our own Milky Way. Two prominent clumps of young bright blue stars are visible in the tidal tale and are separated by a gap. These will likely become dwarf galaxies that orbit in the Tadpole's halo.